If Anthony Bourdain's motto in "A Cook's Tour" is "Eat what the locals eat," the author of "Steven Jenkins Cheese Primer" (no apostrophe) might add the corollary, "Don't eat what the locals eat if you're not where the locals are." For one of the most important, if depressing, pieces of information in this info-packed book is that we in this country are banned, through the wisdom of our government, from eating authentic European cheeses the way they were intended to be eaten (i.e., made from unpasteurized milk). As a result, many "European" cheeses sold in the US, Jenkins tells us, are pallid and bland -- if not downright heretical -- imitations of their European namesakes. If we want to try, for example, a "real" Camembert, we'll just have to wait until we get to France. The cover of this book describes Steven Jenkins as "America's most opinionated authority" when it comes to cheese, and I've no doubt that's true. His opinions do in fact come through loud and clear. As with any "authority" on matters of taste, you can give his opinions as much weight as you think they deserve. There's no question, though, that Jenkins is immensely informed about his topic. And if you feel a little self-conscious carrying this Primer to your local *crémerie*, rest assured that it would still be easier than trying to memorize all the facts, tips, recommendations, and warnings the book contains. I worked as a cheesemonger for five years, have shopped at Mr. Jenkins counter at Fairway in NYC, and have attended American Cheese Society conferences where he has spoken. When I've heard him speak, he has always admitted that there is incorrect and out of date information in this book - it was published in 1996, and since then, some cheeses that were unavailable in the U.S., or only available in pasteurized versions have become available or additionally available in raw milk versions. For example, on p. 159, he states that Bleu d'Auvergne is only made with pasteurized milk. There are versions now that you can buy in the U.S. made with raw milk and have been for at least five years. It's not a huge problem for a casual reader that there are errors in the book - though some of them are factual, many of them are changes caused by the growth in interest in good cheese in the U.S. Availability is changeable, and we get to eat more delicious treasures because of greater interest in cheeses here in America, which includes the promotion of cheeses by Mr. Jenkins. I've heard that he's working on a second edition, but that was a couple years ago, and a revision of a work like this is certainly a long process. That being said, the picture on p. 116 *is* captioned incorrectly. The text above the picture is about Emmentaler. A wheel of Emmentaler (originally from Bern, a bulging Swiss cheese with holes produced by the action of innocuous bacteria added to the curd in production and a smooth, brushed rind) is identified as a wheel of Comte (a cheese from the Franche-Comte region of France with a few small holes, and a flat, bumpy, natural brown rind, pictured on p. 114). This is obviously an editing mistake. Believe me, your average book editor is not going to be identify cheeses by sight at ten paces as a cheesemonger can. If you turn the book upside down and look closely, you will be able to read the words "Grand Cru" on the top of the cheese. It's Grand Cru Emmentaler. Mr. Jenkins tells us himself, "I'm opinionated about flavor and pull no punches." He is opinionated, and his likes and dislikes come through strongly. Don't decide to dismiss a cheese entirely because he doesn't like it, or accept it just because he loves it. You just can't do that with food. This is a chatty, enjoyable, conversational read, but if you want to learn about cheese, don't just read this book. Read others too, and *most importantly*, go out and meet your local cheesemonger and taste all the different types of cheese you can! Pity this book doesn't have clear colour photographs. The content is excellent but the edition I have looks rather badly reproduced. I credit this book with opening my eyes to the wide world of cheese. As a true neophyte, I use this book as a starting point whenever I head out to Whole Foods to bring another cheese back to the family (sorry, The Cheese Shop in Beverly Hills is just too darned far). Do keep in mind two things about this book. One, it is a cheese primer, not the bible of all things cheese. Use it to pique your curiousity and to get ideas. Two, taste is subjective and just because a cheese expert likes something does not mean you will (and vice versa). Take Taleggio and Oka. Mr. Jenkins finds Taleggio to be sublime and meaty. I find it to be stinky and bad tasting. Mr. Jenkins finds Oka to be stinky and mediocre. I think it rocks (my wife does find it stinky, though--okay it's a bit stinky but it tastes really good). He's also dismissive of Mimolette while my whole family loves it. Not a ding against Mr. Jenkins, though, because I would not have tried Mimolette if his book had not inspired me to try everything. Just remember to take his subjective opinions with a grain of salt and you will be fine. What have you got against Steven? This is a GREAT book! Evidently the reviewer whose words are displayed below has something personal against Steven Jenkins. What's the deal with that? No one in their right mind who knows and loves cheese would ever feel that way about this fabulous book. In any case, be advised that the reviewer below is flat-out wrong on almost all of the errors he cites from the Cheese Primer. I repeat: they do not exist! Not only is the cheese in the picture on page 116 indeed Compte (one of the said reviewer's "favorite" errors), but for it to be msitaken for Grand Cru Emmenthal is not only a careless, but utterly misinformed remark. As for the cheeses the anonymous reviewer (too ashamed to reveal his name!) describes as "boring" and "mundane", their very appeal lies in their ability to intensify and flourish as time goes by. Perhaps someone doesn't have the patience to wait until his cheese have arrived at the appropriate age. When determining the quality of fine cheese, why take the word of an anonymous reviewer rather than someone who ahs obviously worked with cheese for more than 30 years, and has travelled all over the world simply to examine it like Steven Jenkins has?! Perhaps if this reviewer's name were confident enough about his opinions to post his name, one might feel more confidence in his review; also, we Amazon shoppers could judge his credibilty for ourselves. Working as a dairy technician in a medium sized ice-cream-factory, I needed something to expand my knowledge on the subject. That's why I bought this book. And I was amazed: Ice Cream and Frozen Desserts: A Commercial Guide to Production and Marketing really met my expectations and did a lot more. It's well written, easily accessible and thorough. A must buy for both ice-cream-professionals and enthusiasts. This book was *exactly* what I was looking for to help me get started in this business. 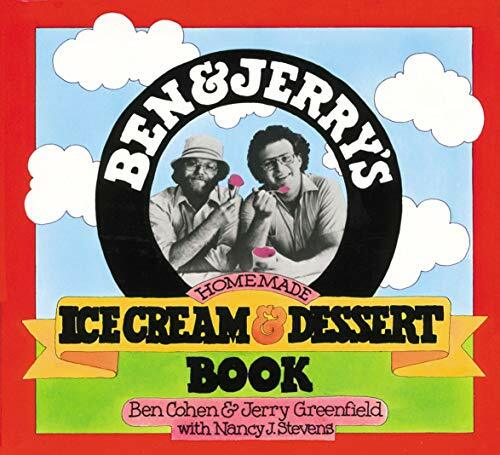 A very broad overview of many different topics related to the ice cream business. As my plans are to possibly open a parlor, some of the aspects of the commercial operations were not useful to me, but it *was* at least interesting to see how the big boys do it. The one area that I was a little disappointed in was the business aspects of it. There were some general discussions of things to accomplish, without any real instruction in how to go about actually *accomplishing* them. Overall, well worth the (rather steep, I admit...) price. 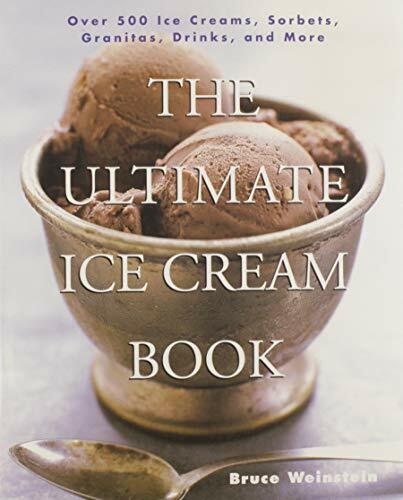 This book contains invaluable information about making ice cream and gelato and about setting up and marketing the product. I was not disappointed and learned a lot. As a professional in the industry for 11 years, this by far is the most intensive book I have had the pleasure to read. 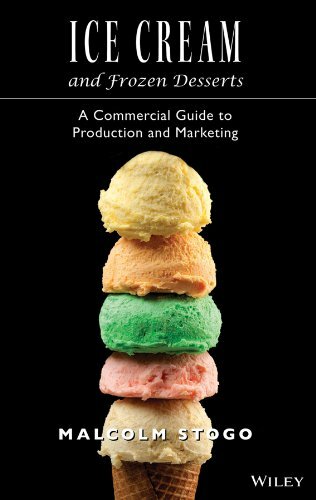 Not only to those who produce ice cream, but anyone interested in the industry as a profession will find this very informative and enlightening. This was obviously written by someone who has exstensive industry knowledge and truly wants others not to make the costly mistakes one often makes in a new endever. If I had read this 11 years ago I would have saved thousands of dollars and a whole lot of misdirected time. Excruciatingly chic to the highest degree, the Nobu restaurants are among the hardest to get into on three continents. They are the personal inspiration of a Japanese sushi-trained chef, Nobuyuki Matsuhisa, who, with unusual experiences in Peru, Argentina, and Alaska behind him, was fortunate enough to open an establishment in Los Angeles into which part-time restaurant entrepreneur and actor Robert De Niro happened to wander. During those years on the Pacific coast, Nobu began to experiment, combining the pure, fresh, uncomplicated flavors of sushi with the Western flavors of garlic, chili, and coriander. As he attracted a more upscale clientele, he complemented those flavors with luxury ingredients such as truffles and caviar. 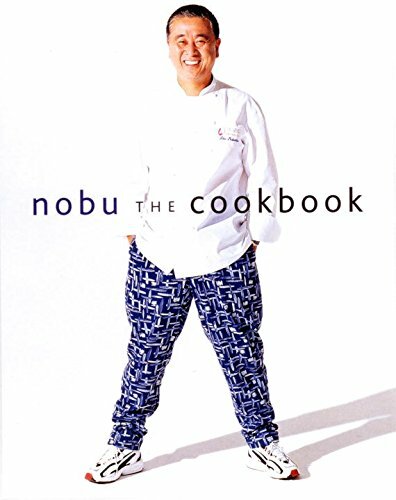 Nobu: The Cookbook represents the current state of play. Exquisite, expensive, and breathtakingly stylish, this food is designed to impress with its artful simplicity. Perhaps the two most representative dishes are the most celebrated: the New-Style Sushi, in which raw fish is given a sizzling dressing of hot oil; and the beautiful Black Cod with Miso, marinated in sake, mirin, and miso for three days then grilled and baked and served with a single ikebana-like spear of pickled juvenile ginger. Altogether a beautiful production. I love the local L.A. Nobu restaurants (Matsuhisa and Ubon), and I enjoyed the book from a purely entertainment perspective. The photographs are beautiful, and I found some of the recipes to be fairly do-able. However, it is noteworthy to mention that quite a few ingredients are difficult if not impossible to find in the U.S., even at Japanese specialty markets (Nobu himself admits that he included recipes that have "many ingredients that can only be found in Japan."). These are interesting, but I don't make it to Japan often enough to be able to whip these dishes up for my dinner parties. Another thing I found somewhat annoying was all of the Hollywood name-dropping the book is peppered with. I don't really care which celebrities have dined in the various Nobu restaurants, nor do I care what their favorite dishes are. The fact that Nobu once made lunch for Princess Di was equally unimportant to me. The thing I really appreciated was learning more about the quality and "kokoro" (heart) that goes into some of the dishes I've enjoyed at Matsuhisa. The book definitely inspired me to go and eat there again soon! 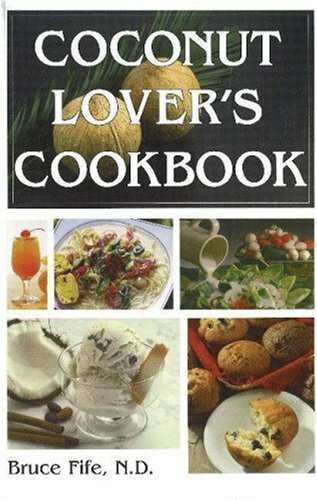 While many of the recipes we have tried from this book have produced excellent results, it is not for the novice nor for the cook who cannot find exotic ingredients. We live in the San Francisco Bay area and must make special trips to the Asian seafood markets because the local grocer, although high-end, does not carry the exotic varieties of fish and shellfish that he uses. He does not offer suggestions for substitutions. The food is very good, but you can tell that this is definitely a vanity cookbook. I don't think most home chefs could use this book - it is definitely for the obsessive foodie who would go to any lengths to prepare his recipes. Good for special occasions or for those who have a lot of time and resources for foods. Wonderful plate presentations. Recipes are more for the experienced cook. Obviously, reading and actually executing the recipes are totally different things. Procedures appear simple but technique will play a very important role in Nobu's dishes. If you're a beginner and interested in Nobu's type of cuisine, get your copy and practice, practice, practice! Ingredients are not easy to get (hard to find and/or expensive). After an exhaustive search for the Spider Roll (soft shell crab roll), we discovered it in this book. The recipe is easy to follow, the photos are fantastic and really step you through the process. Nobu simplified the Japanese/Sushi cuisine enough that even a first-timer like myself found it so easy - can't wait to try other recipes. I generally expect to find one or more deficiencies in small guides like this volume from Aliza Green, so I was not surprised to find some. I was pleasantly surprised to find that the book also covered a lot more ground than I expected. 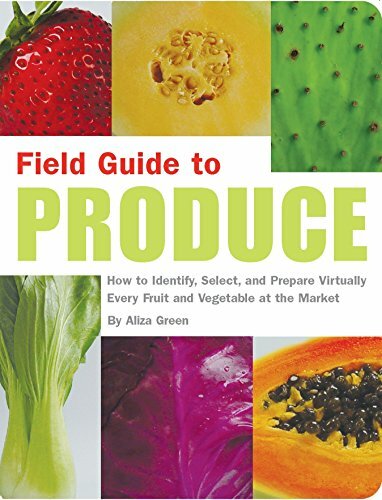 The first positive aspect of the book is the title, 'Field Guide to PRODUCE'. It would have been easy and misleading to say it was a guide to fruits and vegetables, when many items in the book such as chestnuts and mushrooms are neither fruits nor vegetables. The book should have taken this positive title one step further and not divided entries up into fruits and vegetables. As I said, chestnuts and mushrooms are neither, and other products such as tomatoes are classified under their commercial category of vegetable instead of their botanical category of fruit. The next positive aspect of the book is that the only product I could not find in either a primary entry such as 'cabbage' or as an entry type such as 'Brussels Sprouts' was the truffle. I will forgive them this omission, as it is the rare megamart that even carries truffles. On the other hand, the book did include such rarities as durian, loquat, and mung beans (although I thought the coverage of mung beans could have been a bit better). Another positive aspect is that for produce such as apples, pears, cabbage, and tomatoes, several major cultivars are cited, with the best uses for each given. The single biggest use for this book would probably be to find out when produce is in season, how to choose the best specimens, how to clean them, and how to store them. I will not be searching this book for the best fruits for a particular dish, although I may refer to the properties of apples to pick the best variety for a tart. On this subject, the book is excellent. It tends to be very conservative in specifying storage times. It gives apples about two weeks in a refrigerated produce drawer, while I have successfully kept some there for two months with little degradation. Another use may possibly be to help identify a particular item in the grocery store. I often run across tamarind in South Asian recipes, but I would be hard pressed to describe exactly what it looks like, and most written descriptions really don't seem to hit the mark. A picture here is truly worth a thousand words. For this reason, there is probably a virtue in bringing all photographs together in a single section rather than having them accompany the article of the product. Another reason is probably because this was cheaper to publish. Useful aspects of many articles are things like the climates in which the plants flourish, the land in which the product was first cultivated, the origin of 'manmade' products such as grapefruit (from orange and pomelo), the scientific name, and best uses for products. I am constantly amazed at how many of our most commonly used fruits and vegetables originated in or near the Fertile Crescent formed by the Tigris and Euphrates rivers. Several alternate names like 'aubergine' for eggplant are given; however, the author would have made this feature immensely more useful by including the alternate names in the index. Great help for people scratching their heads over 'rocket' in Italian salads. One 'expected oversight' is the absence of cross-reference entries. Brussels Sprouts, for example is in the index, pointing to a paragraph in the article about cabbage, but there is no entry for 'Brussels Sprouts, See Cabbage' in the main text. Broccoli and Cauliflower are derived from cabbage and even have the same scientific name, yet they get their own articles. This rant is probably due entirely due to my fondness for Brussels Sprouts, so you can take it with a grain of salt. Missed opportunities are the absence of a tabular presentation of produce seasons and tables of uses versus varieties for major families of products such as apples, pears, cabbage, oranges, and tomatoes. A fun feature, albeit somewhat difficult to accomplish may have been a table or 'tree' of food preparation techniques with most useful products. I could add more nice things to see, but most of these would lead to a full-sized volume, loosing the utility of the 'field guide' size. This is a better than average book of its type. If you need something to make the best of finding, selecting, cleaning, and storing produce, this is your book. It will also help you pick the best apple for the pie and the best potato for your salad. Carry this little book whenever you shop for produce! I'm a Philadelphian, like the author, and have taken cooking classes with her. She's as good a writer as she is a teacher. This book is pretty complete, even to including things as exotic as African horned cucumber, caltrope and yautia. Her advice on using each item is clear and specific, accesible to the rawest cooking beginner and still helpful to the expert. The pictures are beautiful, full-color photos that make identification very easy. I only wish she had ncluded more pictures of different kinds of beans, squashes, tomatoes, greens and so forth. Of course, the book might just get too big to carry to the produce vender's. At Philadelphia's justly famous Reading Terminal Market, such a book is particularly useful as the venders regularly offer all sorts of unusual produce. This lovely book will make the explorations much more fun. Anybody who goes to farmer's markets will find it useful. It's a good read, too; I've read it cover to cover. This is such a perfect little book to give as a gift. I have tried two of the uses mentioned in the book--frothing oil and water for my dry skin and freezing oil in my ice cube tray for use instead of butter. Both were great! I highly recommend this book--it's filled with interesting historical facts and fun new uses to try. This book is such a treat and a great gift for any foodie!It is visually beautiful with olive colored text and lovely illustrations.The tips are surprising on how to use olive oil and the long history of olive oil compelling. I saw the writer speak in the bay area and she was delightful. 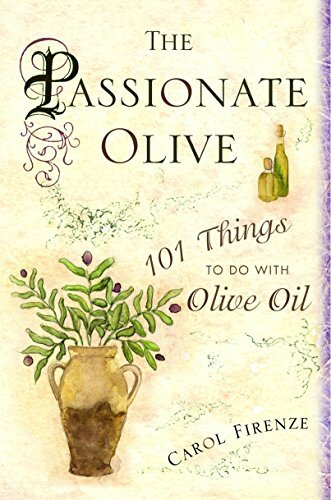 She made a great suggestion to bring a copy of The Passionate Olive book(of course) and a bottle of olive oil to your next dinner party. I loved this book.Lots of great information and fun to read! I have begun using some of the Olive Oil uses suggested in this book already and they work!Try it yourself. My husband bought this for me. It sat on the shelf unused for a couple years, because I had so many cookbooks and I knew nothing about this book. (Ok, I judged it by its cover, and it didn't look classy.) One day I made something out of it, and it was fantastic. So I made something else another day and it was incredible. This book has recipes for all sorts of fish (except tilapia, which the author says is simply a muddy-tasting fish). Every recipe I have tried tastes like high-end restaurant fare. It is now one of my favorite cookbooks and I have given two of them away as gifts. I was trying to expand my cooking skills and replacing beef, chicken, and pork in my diet with fish and seafood when I picked this book up. It really helped on both counts. Bittman provides a great deal of insights and helpful information into buying fish and seafood, and made the seafood counter at the store a lot less intimidating. The recipes are not intended to create ohhs and ahhs. They are simple, yet flavorful dishes that can be whipped up in 30 minutes, in most cases. These are the kind of recipes where I can pick something up on the way home from work, and put together something tasty for the family in short order. 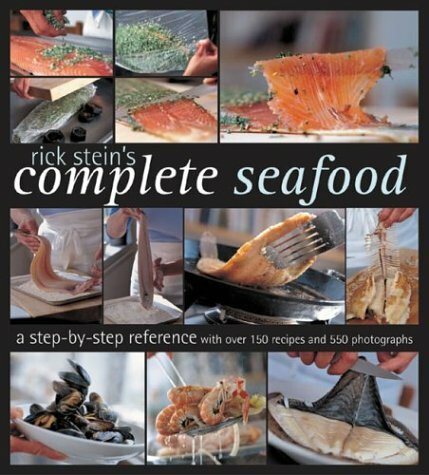 Because most of the recipes are fairly simple, I would encourage readers to use the book as a base to expand ones cooking horizons with respect to fish. The recipes I tried were good, but needed a little extra to round out the flavor or give them some oomph. Unfortunately, tilapia is largely ignored by Bittman, and it would have been nice to get some recipes for this fish, which is readily available in California. Still, this book is a great addition to my cooking library. Of all the single topics on which cookbooks have been written, it seems to me that fish is the most common. It is certainly true if you look at my library, where there are seven (7) volumes devoted to fish in general, fish of a particular region, or even one family of fish such as the salmon or oysters. Not only is it a popular subject, but it is a popular subject for prominent male cookbook authors. In my library alone, there are volumes by James Beard, James Peterson, Alan Davidson, and the current volume by Mark Bittman. All of these authors are simply dripping with awards for cookbook writing. There are at least two different approaches one can take to a single subject cookbook. James Peterson in his books on Fish, Sauces, and Vegetables tends to take a deep look, with more details about a fewer number of recipes. Mark Bittman, in this book, tends to take exactly the opposite approach. His main selling point is that he is giving us 'more than 500 recipes for 70 kinds of fish and seafood'. Fitting this approach, the book is laid out very much like an encyclopedia, with all articles on fish labeled by their common names, placed in alphabetical order. Each article begins with a taxonomic section giving both common and scientific names, common commercial forms, general description, substitutions, and reference to buying tips. The scientific name may not be very informative, as a common name such as shrimp may be applied to not only multiple species, but also multiple genera covering thousands of species. The general description is also a mixed bag in that it may be anything from physical description to geographical distribution to economic importance. The most important item in this header is the 'For other recipes see:' entry. This is where you see that a recipe that is good for conch, mussels, or oysters may also be good for clams. I get some sense that the author could have exercised some restraint here. As an example, consider that while squid and shrimp share the property of being done best by cooking very quickly, I may be reluctant to apply a long cooking squid recipe, the kind Mario Batali describes as giving a 'bottom of the sea' flavor to any kind of shrimp. The essay introducing each named fish can vary from three pages for 'shrimp' down to three lines for 'tilapia'. The longer essays are very informative and, as far as I can see, very accurate. I can also add that they can express very strong opinions about some fish. The very short entry for tilapia dismisses the flesh of the fish as having an undesirable, murky flavor. 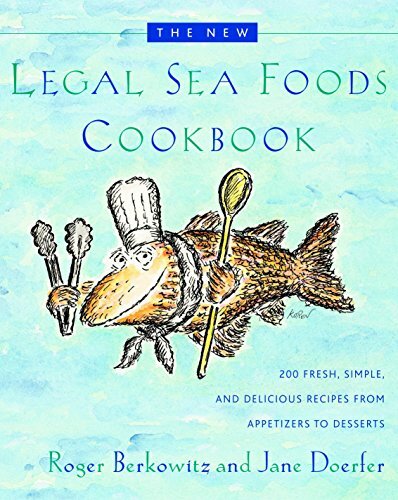 The author gives no recipes for this poor fish and simply leaves us to consult the recipes for porgy and sea bass. The number of recipes per fish is roughly proportional to the economic desirability and availability of the fish. Shrimp, for example, gets twenty recipes including three different versions of curried shrimp. Other classic recipes such as crab cakes also get more than one treatment. Oddly enough, the best-known American shrimp dish, the shrimp cocktail, is not here. Not that I really miss it. The twenty recipes do seem to cover the world, with a just about right distribution of recipes from America, the Mediterranean, and the Pacific Rim. Most recipes are concise without being overly sparse. The list of ingredients is better than many. For example, it goes to the trouble of specifying a 'dry' white wine for a sauce and it is precise enough to say ½ cup minced parsley rather than the less precise 'handful of parsley, minced'. The procedure is clear and I have yet to find any mistakes (I cannot say the same for the equally distinguished James Peterson's procedures). I prefer recipes written with numbered steps, with each step beginning on a new line, but I prefer good recipes to bad even more, and most of these recipes seem to be better than average. As many, if not most of the recipes in this book are ethnic classics and not the invention of the author, the chance is good that they will appeal to those who are disposed to like the ingredients. If you don't like coconut, don't fault the author for giving recipes using coconut. Since there are so many different recipes from so many different culinary traditions, the chances that you will find something interesting to do with your lovely swordfish steak will be very high. 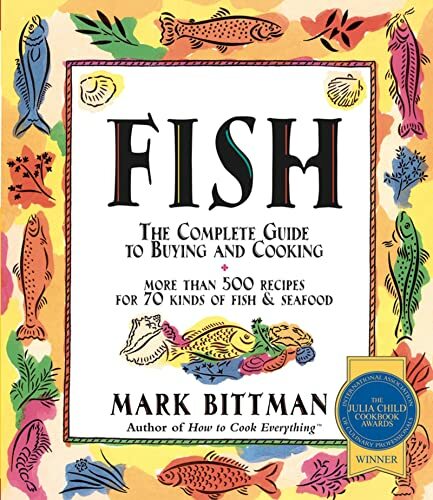 As a food editor for 'The New York Times', Bittman has greater access to current and historical information about fish dishes than most, so the depth and reliability of the information herein is very high. This book is by no means a complete book of fish cookery. There are some entries for escabeche and seviche, but not a word about sushi or sashimi. Of all the books I mentioned on Fish Cookery, I may prefer James Beard for the last word on recipes from America or Alan Davidson for recipes from the Mediterranean, but Bittman has given us a book which gives a broad coverage to recipes from around the world. He succeeds admirably in achieving his goal 'to teach you how to buy good, commonly available fish, and cook it quickly in a variety of basic and delicious ways. Highly recommended. A better general reference for the average cook than other books in a crowded field. I didn't imagine that I would want the book, "Fish", but I found myself consulting it whenever I went to the fish market. It sits on their counter. I bought things I might have never attempted to cook but that I was enticed by Mark Bittman's recipes. I now own it and use it regularly. Read his suggestion regarding tilapia. It testifies to his honesty and clarity of opinions. It did not deter me from preparing tilapia in the style of bass, but with a giggle. Poached fish? Surely you jest, Mr. Bittman! I fell into Bittman's category two of potential readers: a long-time fish cooker who always cooked the same ol'-same ol'. I was a master of grilled salmon steaks; I knew the difference between wild king salmon and farm-raised; my most recent guests loved it; but eventually even the best salmon steaks become tiresome. Now "Dogfish poached in ginger sauce" is a new favorite, one of many. Unlike many who have given this book a great review, I don't think I have ever completed even one of Bittman's recipes EXACTLY AS GIVEN. And that's why I love it--even though I'm always lacking one ingredient or another, he encourages intelligent flexibility, as in (re the cited recipe) "Don't hesitate to make this dish even if you don't have stock; it will still have plenty of flavor." You gotta love his attitude. And for the record, my version, made with Swanson's chicken broth and twice the ginger, was superb. Ted Nugent likes to say, "You can't grill it until you kill it." Well, even if you don't kill it personally, now you can grill it just like the Nuge. In Kill It and Grill It, Ted Nugent shares his favorite recipes for such exotic fare as wild boar, pheasant, buffalo and venison. 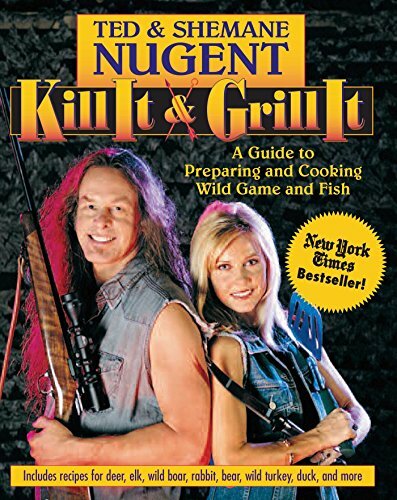 Kill It and Grill It is filled with hunting anecdotes, detailed instructions on cleaning and dressing your game, helpful hints for those new to hunting and cooking wild game, nutritional information, and of course, recipes. And while Ted doesn't buy his meat wrapped in plastic, there are plenty of recipes to tide you over when the hunting party comes home empty handed. Ted has a recipe for every meal and every occasion. I'm Goin' Lookin' For Some Bear!!! I bought this cookbook for three reasons. First, my effort to become a vegan met with predictable failure. No matter how I prepared my vegetarian dishes, they still tasted bland and made me feel like the grass-chewing cow I was constantly thinking about eating. Second, I liked the cover of Ted and his eye-pleasing wife Shemaine (coincidently, Shemaine is the name of one of my neighbor's poodles who my bulldog (Colonel) keeps harassing). Anyhow, I liked the cover of those two delightful carnivores posing with their tools of the trade. Lastly, I've been looking for a good game cookbook. I don't do a lot of hunting, but when I do I'm often perplexed about how to prepare the venison (I have yet to kill a bear or some of the more exotic animals for which this book has recipes; as a side note: I believe I can eliminate the duck problem in my backyard and also prepare a delicious dish for my neighbors with plenty of scraps for their new puppies). This great cookbook covers all the details you need for making a meal out the game you've dispatched and the recipes look delicious and fairly easy to follow. The writing style is a strange combination of puerile, amusing, and informative--and it works! I am very glad to have this cookbook in my kitchen and plan to put it to use the next time I put my hunting rifle to the test! Most Definitely Recommended. Hoppy Hunting!! The recipe's are great and the anecdotes provided by Ted and Shemane make this the most enjoyable cook book I've read. This is definitely not Julia Child. What sets this book apart from other hunting and cook the kill books is its coverage of self-reliance and wholesome nutrition of wild game that more people should be aware of. This isn't a go out and kill for fun, and act like a jerk book. Its well thought out and for many like myself who live in rural, hunting areas a must own book. And if I do say so myself it reminded me so much of all my late Father taught me about being personally responsible for what I ate. That wild game is healthier and that the quest is almost spiritual in nature, and that a quick clean kill is the obligation of the hunter. As is proper dressing out of the animal and NO waste! Now I will ad that I am even a bigger fan since seeing Mr. Nugent on two shows the past few months. One was with his daughter where he was discussing his conservative values and one was with Sean Hannity (Fox channel) at the July 5th 2004 Freedom Concert which is a non-profit organization that provides scholarships to the children of American military personnel killed or permanently disabled in action. Ted Nugent walks his talk which is a must for me! very good if you are a into looking at pictures of a dumb hillbilly and his guns posing beside slaughterd beasts. I aint a hippy and I eat meat but this Ted Nugent should run for president or have a hunting accident and get a photo of it. I would pay to see that. Braising--cooking food slowly and at low temperatures in a closed pot with a little liquid--produces deeply flavorful food. Molly Stevens's All About Braising is a definitive exploration of this soul-satisfying approach to food. 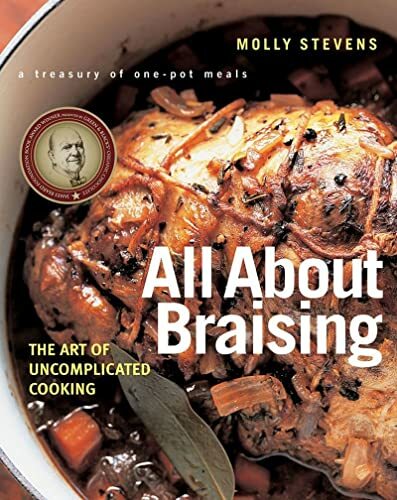 With 125 simple recipes for braises of all kinds--from meat and poultry through seafood and vegetables, plus a thorough anatomy of technique (Stevens explores oven versus stovetop braising, for example)--the book will please cooks at every skill level. Most importantly, perhaps, it will send them to the kitchen to prepare enticing dishes such as Braised Endive with Prosciutto, Whole Chicken Braised with Pears and Rosemary, Duck Ragu with Pasta, and Veal Shoulder Braised with Figs & Sherry. Braises can also taste as good or better the next day, and Stevens supplies advice for second-day service. Included, too, is an "Opinionated Pantry" which, besides exploring relevant ingredients, expresses Stevens's ongoing commitment to using only the best and freshest available. I got this book based on a recommendation from the Washington Post. It's small (actual pocket size) and sturdy.I found it a bit hard to open all the way. The first 20 pages or so list sushi etiquette and tells what is happening behind the sushi bar.The next 50 pages is the part of the book that let me down the most. 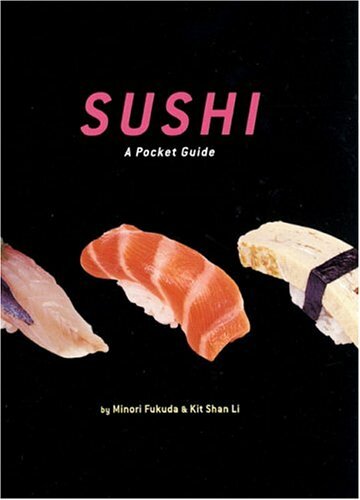 There is only one piece of sushi per page with a picture, the japanese spelling and pronounciation, the 'dumbed down' definition, and a brief description.The book also mentions if the piece is vegetarian or if it has been cooked. It covers most of the sushi that I have had in my lifetime (I'm fairly adventurous) and not too much else.I think the book could have been made less than an inch bigger so that two pieces could fit on a page. The Whole Beast: Nose to Tail Eating is a certified "foodie" classic. In it, Fergus Henderson -- whose London restaurant, St. John, is a world-renowned destination for people who love to eat "on the wild side" -- presents the recipes that have marked him out as one of the most innovative, yet traditional, chefs. Here are recipes that hark back to a strong rural tradition of delicious thrift, and that literally represent Henderson's motto, "Nose to Tail Eating" -- be they Pig's Trotter Stuffed with Potato, Rabbit Wrapped in Fennel and Bacon, or his signature dish of Roast Bone Marrow and Parsley Salad. For those of a less carnivorous bent, there are also splendid dishes such as Deviled Crab; Smoked Haddock, Mustard, and Saffron; Green Beans, Shallots, Garlic, and Anchovies; and to keep the sweetest tooth happy, there are gloriously satisfying puddings, notably the St. John Eccles Cakes, and a very nearly perfect Chocolate Ice Cream. Even if I never cook a single recipe from this book, I will treasure it for Fergus Henderson's voice. "Find the happiest tomatoes you can." The writing is charming, and most encouraging for those of us who love to eat the odd bits but never cook them. And not only the odd bits -- many of the recipes for the more usual parts and for accoutrements sound wonderful, too. This book is centuries behind its time and years ahead of its time-a great book for anyone who cares about food, cooking or eating. Thank God for Henderson's work and craft. He's a marvel. More people in the United States ought to be familiar with his work. I hope this book is just the beginning. 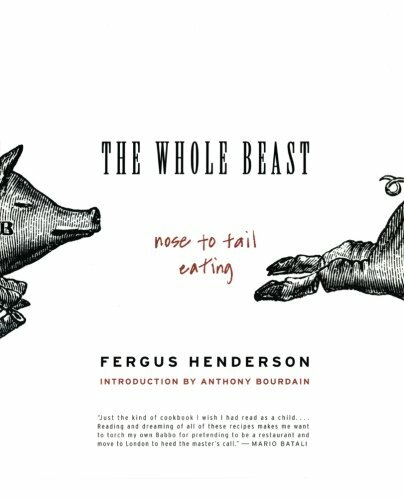 Fergus Henderson, the chef author of this book subtitled 'nose to tail eating' is a cult hero among foodies and among heroes of foodies such as Tony Bourdain, who writes the introduction to this new edition and Mario Batali, a major advocate himself of using the whole animal. For several reasons, this book is likely to have little to no value to the average person who cooks and who may refer to a cookbook now and then. The recipes commonly use ingredients that are simply unavailable outside better butcher shops and farmers' markets. The recipes also commonly use techniques that are the antithesis of fast cooking and low fat cooking. There are some recipes that literally require up to two weeks to complete. The true audience for this book aside from culinary professionals are those who religiously watch Alton Brown's 'Good Eats' , read John Thorne's books and newsletter as if they were gospels, and study books by Paul Bertolli, Eric Rippert, Judy Rodgers, and Jeremiah Tower for subtle new techniques to squeeze the last ounce of value from their primo materia. Just to be sure it is clear to you what this book is all about, it's primary subject is preparing in a cuisine absolutely everything but the oink, as the saying goes, from a pig and other animals. To this end, the author presents us with recipes for pig's head, pigs jowls (Mario Batali's favorite guanciale), pig's ears, pig's tail, livers, hearts, tongues, and the most beloved stomach as used in preparing the old Scottish classic, haggis. If this were the limit of the author's novelty, there would probably be little interest in the book among chefs. The author pushes this point of view to cover culinary techniques which are either not commonly used by the average chef and which are generally unknown to the average cook. The two best-known methods are brining and preserving in oil as in a comfit. Brining has probably become much better known among American foodies thanks to the efforts of Alton Brown and Shirley Corriher. It is a method of soaking meat in a solution of salt, sugar, and aromatics to impart moisture to the meat. Creating a comfit involves storing meat in fat rendered from the meat and fatty parts of the animal from which the meat was taken. The method is best known as a method for preserving duck legs, but it may be applied to many other meats. The author applies both techniques to a wide variety of foods. If any part of this book may have use to the average reader who takes cooking seriously, it would probably be the author's lessons on the creation and use of stocks. Unlike chefs at the cutting edge of American haute cuisine such as Judy Rodgers, Henderson's stock techniques are beautifully simple. He does recommend the uncommon method of creating a raft to clarify stocks. I have not seen this method used outside of Culinary Institute of America texts, but the author presents it so simply that one need have no fear that it is too complicated for them. That is not to say it does not take time. This is an example of why the nonprofessional will want to read this book. It is just chocked full of unusual techniques, some as simple as they are unexpected. The author goes against a tidal wave of preference for the Italian flat leafed parsley and chooses to use curly leafed parsley in most recipes including an utterly simple method for flavoring salt with the herb and adding it to a simple sauce. While the focus of the book is on meat, it does cover the very typical range of dishes with chapters on Stocks, Soups, Salads, Starters, Main Dishes (mostly the odd body parts are here), Birds and Game, Fish and Shellfish, Vegetables, Sauces, Puddings, and Baking. The refreshing iconoclasm extends even to the discussion of routine sauces where the author is clear to all that aioli is NOT mayonnaise with garlic, but a thing onto itself. He probably also breaks a few hearts by mixing olive oil for both mayonnaise and aioli in a food processor. The book should also be a treasure for armchair foodies who get no closer to a Garland range than a read of reviews in 'Cooks Illustrated'. This chef has a way with words. You may almost think of him as a literate Jaime Oliver who suggests you put terrines 'in the fridge for 24 hours to allow it to find itself'. I sometimes find it tedious to read even good recipes. There is no such problem with this book. Highly recommended read for all professionals and foodies. Great source of ideas, even if you never make any of the recipes. After having the most fantastic meal at St. John, I was compelled to buy the book. Although some of the recipies may seem a bit strange, there certianly are enough recipies that the adventurous home cook can try. I'm really looking forward to trying the "Roast Bone Marrow and Parsley Salad". 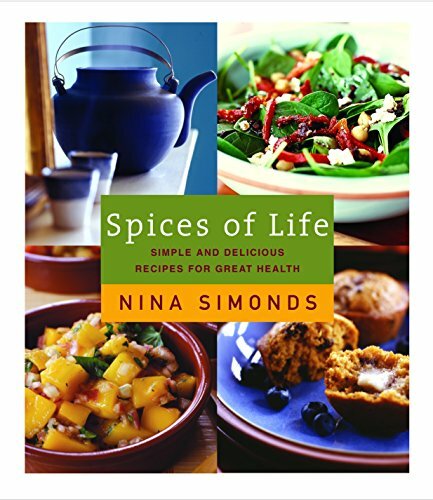 This book contains nearly 450 recipes with a mixture of both vegetarian and nonvegetarian dishes to choose from. You will find recipes for creating savory main dishes, appetizing side dishes, satisfying snacks, and nutritious beverages. You will find recipes for dairy-free smoothies and blender drinks, creamy soups and hearty chowders, delicious curries, stews, and casseroles. If you like desserts, you will find plenty here to choose from, including German Chocolate Cake, Coconut Pecan Pie, and Chocolate Almond Ice Cream. Chinese stir-frys, Spanish paellas, Japanese sushi, Indian thorans, Thai salads, Turkish pilafs, Italian risottos, Senegalese yassas, American gumbos: if rice isn't the heart and soul of all these diverse dishes, rice can be found piled right there at the side of the plate, or in a bowl. To say that Alford and Duguid, authors of the award-winning Flatbreads and Flavors, deliver the world of rice is much too simple an understatement. Your days of buying one rice to serve all purposes will end with even a cursory reading of this lovely book. The authors are photographers as well as writers, but their greatest skill may be to travel the world at the level of the culture they visit. They seem able to drop away from Western culture and hunker right down with rice vendor or cook, no matter where. 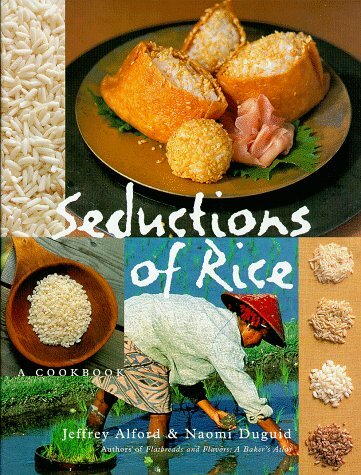 Seductions of Rice opens with all the basics of rice, everything a reader would want to know and then some. Then on to the cultures of rice: Chinese, Japanese, Thai, Indian, Central Asian, Mediterranean, Senegalese, and North American. Recipes either made from rice or to accompany rice range from Chinese Congee to Thai Green Papaya Salad to Japanese Quick Morning Miso Soup to South Indian Lentil Stew to Cuban Black Beans to Mexican Green Rice. My daughter tells me not everyone has at least four kinds of rice as pantry staples; I tell her they should - and this book gives them reason to. This has the most comprehensive inventory of rice types that I have seen. For example, I have only recently found a source for red rice; this book distinguishes between Thai red rice, mahogany rice, Bhutanese red rice, Himalayan red rice, South Indian red rice, South Asian red rice, Vietnamese red cargo rice and Wehani. Reading the differences, even without knowledge of what red rice I bought, allows me to adjust the recipes conservatively so that I don't over-cook, over-power or otherwise mutilate my find. The recipes are well chosen; many of the recipes are not rice recipes but dishes to accompany rice. This gives the book a greater range than its title might imply. The stories of learning the worldwide recipes on site add to the enjoyment of the recipes; they provide a travelogue of the search for new rices and rice uses. They are accompanied with excellent photographs of growing, harvesting, and cooking rice. Recipes come from Italy, Mexico, Japan, Turkey, Thailand, India, China, USA, Senegal, Persia, Jamaica, Spain, Uighur (Russian-Chinese border). There is an index by the geographic region which allows the book to serve as an ethnic cookbook. This is a cookbook to read and to use. I definately recommend it. No pictures of the recipes! This book is beautiful and informative, and full of color photographs. However, only a few of these photographs are of the finished dishes themselves. You'll see people in markets, rice paddies, rice for sale, landscapes, fish, vegetables, etc. The few photographs of dishes are on the cover and in a small section in the middle of the book. The caption under the photograph refers to the page with the recipe, but not vice versa, so the recipe does not lead you to the picture. Of approximately one hundred recipes, only about 25 have photographs of the finished dish. Also, about a third of the recipes don't feature rice itself, but are of dishes to be eaten with rice. 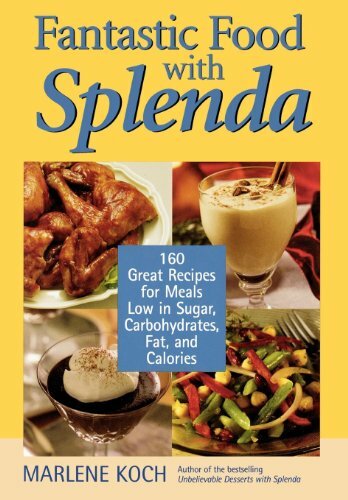 I was looking for a book with lots of recipes using rice, and with color photos of the finished product. This book is not exactly that. There is a great recipe for tofu with tomatoes and coriander (where's the rice? ), the rice-stuffed grape leaves are good as well. There is a lot of information about rice as a crop, different kinds of rice, etc. This book is a combination of excellent travel narratives, photo-essays, and recipes. Most delicious are the fried rice recipes and the dipping sauces. Definitely a pleasure to peruse and also to utilize for simple dinner recipes with complex and authentic flavors. Some of the ingredients are difficult to find in typical grocery stores, but may be found in tiny international markets. A must for lovers of Chinese, Japanese, and Indian cuisines. Obviously, don't buy this book if you don't like rice or starch. But that being a given, this is a wonderful book to read and to cook from. I bought a paperback in a store for about twice this price, so this is a great value and would make a fabulous gift. 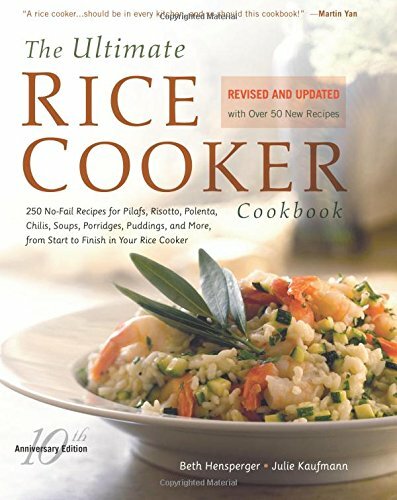 One of the previous reviewers who noted that nowheres near all of the recipes in this book actually _include_ rice was correct--they don't. But the authors talk in their introduction about how their book is meant to be a cookbook for those who eat rice at every meal--how you go home, start cooking rice, and then decide what to eat with it. That said, there are many recipes here that make fast, tasty meals when combined with rice. Must-try recipes include Thai sweet rice cakes and Chinese-style summer stir-fry (to eat with rice). French and Italian cheese experts are not easily impressed but here is a book that even they are getting excited about. The quality of the photography and reproduction are unsurpassed and is complemented by the expertise displayed in the content and presentation of the accompanying information. This is not just a hand-book, it is an historical and cultural record. If the bureaucrats have there way, then the export of most of these unpasteurised cheeses will be banned so, for those of you who love real cheese but cannot get to Europe to eat the ones they make there, buy this book and drool! A handbook. Beautiful and informative, but hard to use. If you know something about French Cheese, and don't mind poring through the whole book to search out generic information, such as the basic cheesemaking processes, you will find this book rewarding. If you are looking for an introduction and recommendations for where to start, this book won't help. The photos are beautiful, and the desriptions of the individual cheeses are very authoritative and complete. But, the bewildering array of cheeses in this book will not help you much as you stand before the cheese counter in the better French supermarkets or your favorite fromagerie trying to choose which of the 500 or so cheeses to eat with today's meals. After living in France for three months, I now can appreciate what this book offers. But, in addition to the "field guide" type of descriptions, I would have appreciated some help in learning how to buy and store cheese (such as why the softer cheeses should be stored on a bed of straw in the shops). There are delightful snippets of information included, or should I say buried, throughout the book, and the photos are truly wonderful. 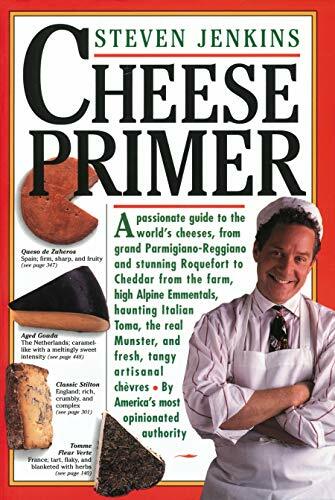 But, for anyone getting started, I would choose a book such as "Cheese Primer" by Steven Jenkins. For reference more than "reading"
Living in France, I am always making the acquaintance of cheeses I had never before known existed. I always scurry to find this book, and look up the tasty morcel I've just consumed. It's great for learning the basics about various cheeses -- and, as noted by other reviewers -- the photos are divine, but it's not the sort of book one takes into the bath to pore over for hours at a time. Put it on your shelf next to your dictionary and thesaurus; it's that useful! 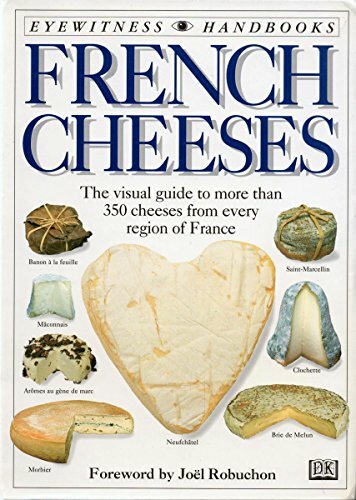 As mentioned in previous reviews, this book does a great job of referencing hundreds of cheeses from France, providing photographs, descriptions, and wine recommendations. In these areas, it does a fantastic job. I've learned a lot reading it and I can't wait to take it with me on my next trip to France. I wish the book gave more guidance on the tastes of the different cheeses and how you might select them. For example, if I like Brie and wanted to try a different nice mellow soft cheese, what might be recommended? This book isn't organized to help answer questions like that. Overall, an important book for anybody serious about cheese. I collect field guides and what attracts me to some is the clever layout and design. This volume is in a class by itself. And the text was so informative that i could not put it dowm.